The Smallest Things, founded in 2014, is a registered charity promoting the good health of premature babies and their families. “Nothing can quite prepare you for parenthood, but for parents of premature babies the planning and expectation of a new arrival is dramatically interrupted. When my first son was born 10 weeks early we were thrown into a world of micro-nappies, beeping machines, breathing tubes, feeding tubes, expressing pumps, portholes, picc lines and rigorous hand washing. Raise awareness of premature birth and the needs of families following intensive care. Promote high quality care for mothers affected by postnatal depression, anxiety and symptoms of post-traumatic stress disorder associated with premature birth. My son Lucas was born at 26 weeks weighing only 14oz (400grams). He was so poorly he had NEC, MRSA, Candida, kidney failure, about 20 blood transfusions and at 4 months had to be resuscitated (spelt wrong?). He is the smallest boy to survive in the UK. He was in hospital for almost 5 months before he came home on oxygen. He was only home a couple of weeks when my maternity leave finished in my job I had for 13 years. I agree maternity leave should start from the day these babies come home, then holidays should be allowed to be taken after that. Then and only then should we even think about going back to work. I wish this had been bought in years ago. Just been reading your blog & it’s so reassuring to know that a lot of the thoughts & feelings I had whilst baby was in special are common amoungst prem baby mums! Hated my thought train at times but now know it’s not just me! My twins were born at 26 weeks, one at 730 grams and the other 550 grams, sadly the small one fell asleep with the angels, the other one is now 15 and ft5 4′, and wonderful. Ah. Our baby girl was born at 27 weeks in January. 9 weeks in hospital with a lot of worry and uncertainty. She came home on oxygen and is still on oxygen now . It’s a world we never contemplated. A situation that never crossed our minds. I’m still reeling from the shock. My husband was on a zero hour contract so could not stop working because we needed his wage. I’m shocked that my friend who had a prem baby nearly 30 years ago went through the same situation we are facing with regard to work. The law needs to accommodate parents with premature babies. I has two girls born at 26 weeks. My first daughter passed away at 11 days old. My second daughter spent 16 weeks in Nicu. We she came home we had lots of medical appointments medication etc. My daughter developed a condition due to misdiagnosed heart condition. The pda was not closed and she develops pulmonary hypertension. My daughter passed away at 23 months old. This time was precious. I lost my job during this time. It was impossible to return. Thanks for your site. It helps me understand more about what my parents went through whilst I fought against the odds. I came into this world at 28 weeks weighing 910 grams. Minutes old I was whisked into a waiting ambulance & christened whilst being police escorted across Liverpool. For my 18th Birthday, I was lucky enough to visit the NICU where I’d spent my first 6 months and meet/thank some of the remaining staff who’d fought tooth and nail for me. I’ll be 40 next year … Not telling you how much I weigh now, but it’s significantly more! I came across this site because I was looking to fight regarding maternity leave for parents of pre term babies. I had out son 10 weeks early with no warning and he was in ICU for 6 weeks. Thankfully he is a healthy 20 month old bouncy boy now. My maternity leave just came and went, when we got our son home he was having to be fed every 3 hours then to 4 hours. Meaning I got little or no sleep ( I didn’t expect my husband to get up with him when he worked 11 hours a day). By the time I returned back to work which was part time I was totally exhausted and hadn’t had a very pleasurable time to bond with our son. Have you signed our petition to extend leave for parents of babies born too soon? We have over 13,000 signatures now! From one preemie mommy to another, I extend my love to you all! We lost our first born son back in March of 2009 due to what they suspect was IC (incompetent cervix). 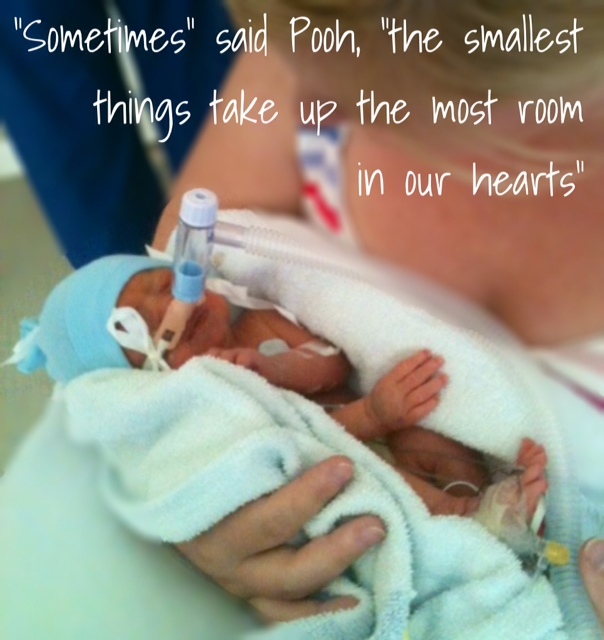 He was born at almost 22 weeks, lived a little over an hour then gained his angel wings. Hardest thing I’ve ever been thru in my life. Second son was born 2 months preemie at 31 weeks, 4 days in March of 2011. He weighed 4 lbs, 5 oz so he was a good weight for his age. He did amazingly well tho. Had a NICU stay of about 2 weeks total. And is now a very healthy, talkative 5 year old & you’d never know he was a preemie. Third son was actually full term! All the way to 40 weeks & had to be induced! Wasn’t an easy pregnancy tho. Cervix & placenta problems. Had to do 2 months of bedrest with him. He was born February 11 of this year weighing 6 lbs, 10.5 oz. I think I shocked a lot of ppl including myself with how far I had went in the pregnancy because of my history. I was shocked with my body but am thankful that I held up to make it to term! My daughter was born at 23 weeks and 5 days. She weighed 500 grams and was 11 inches. She dropped to just over 12 ounces at her first surgery. She spent 5 1/2 months in the NICU and came with O2, feeding tube and every monitor one could think of. Today… She is 14, in the 8th grade, a little on the short side but proud of it! She has mild Cerebral Palsy and ADHD. I am so grateful for websites like this one. The support from other preemie families was the best support I could have ever had! It made the days tolerable and hopeful that my daughter would have another. I myself was a premature baby, weighing the same as a bag of sugar when I was born. As a result of my condition I developed cerebral palsy and my twin sister died of lung problems. As you can imagine this was a very difficult time for my parents. I have just signed your petition and fully support your campaign. I have just listened to your interview on Radio 4 womans hour and I was hugely grateful for the information I heard. After 2 dear friends going through premature births this year, I was enlightened to hear about their reality of this time. You are quite right that it is not a widely known medical world for either pregnant parents or the rest of their support network like myself. Thank you so much for the tireless work you have put into raising awareness of the mental physical and financial strain that premature parents go through. My daughter was born premature at 30+6 and I can fully agree with everything you have said hence why I have signed & shared this petition. What about fathers!? I had to go back to work leaving my daughter in NICU for 8 weeks. When it became apparent that she wasn’t going to make it we fought to get her home for a very precious 6 days before she died. I wish I could have been there with her more, and I wish I could have been there to support wife. We seem to have the assumption in society that fathers have no interest in their children and this is reflected in woeful paternity leave entitlement even with a healthy birth. We are also always pleased to hear from fathers and have many blog posts about the needs of dads during neonatal care. I’ll apologise if I sounded angry. I’ve been sitting here crying as I type because thinking about it brings all the emotions back. Thanks for what you’re doing. It is emotional time for all parents, dads included, and the feelings can last long after neonatal care. What about the NICU babies? Can they get PTSD? My niece died a couple times and was brought back is now 4 bless our angel. But she is having anxiety and hates going back to that same hospital for tests and is showing anxiety in large groups and with certain individuals. Is there help for her? I recently had my son 7 weeks early and set up my own change.org petition https://www.change.org/p/government-review-of-uk-maternity-and-paternity-leave-entitlement-for-parents-of-premature-babies?recruiter=761966017&utm_source=share_petition&utm_medium=facebook&utm_campaign=share_petition Change.org called me and told me about your petition. I’d love to talk to you and see if we can join for e? Thank you for this. I came across your site while looking for information on leave for parents of babies born early. My daughter was born at 29 weeks in January 2018. I am due back at work in January 2019. She spent 2 months in NICU. I would like to extend my leave (unpaid) to at least near her due date. She is still seen regularly by doctors & health visitor and is also on a number of medications which would make it difficult to leave her in someone else’s care. I have written to my employer and I wait for a response. I am a council worker and I and hope they will agree. Hi, my twins were born at 26 weeks in 2014 (luckily there are now happy and some what healthy 4 yr olds) I was only given 8 months paid maternity leave at the time. My twins were in hospital for 10 weeks and I wish there had been a system where my maternity leave started when my first twin left hospital. I felt I didn’t have time to bond whilst in hospital so lost 2 and a half months of cuddling, feeding and getting to know my babies. I ended up taking two extra months off but I had to put it down as sick leave which didn’t look good on my records. I pleased that more employers are recognising the importance of having time with a premature baby/babies and extending maternity leave. Our little girl, Esmé was born at 25 weeks and sadly at 2 weeks old she passed away. I strongly believe that parents and the families do need extra support and the time to come to terms with having a child prematurely. Nothing prepares you for this and the last thing you need is extra stress. This should be made compulsary by employers. Much love to all you parents out there.